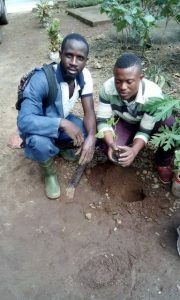 Green Cameroon on the 26th day of july 2017 in partnership with the Association of Linux Friends limbe, planted trees in the communities of Mokindi, Sokolo and Mokunda which are all communities of the Limbe Municipality. The activity falls under the Green Mount Cameroon Project which aims at providing alternative sources of energy for household heating and reducing the pressure mounted by community members on our forest due to their large demand for fuel wood. The Green Mount Cameroon project was funded by EPLC, Yuhan Kimberly and Green Cameroon to support Conservation work in the Mount Cameroon Forest Region and Cameroon. 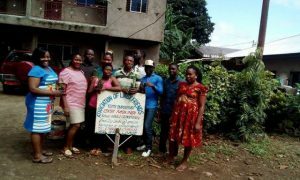 The Team from Green Cameroon met with those from the Association of Linux Friends Limbe who together carried out the tree planting exercise which lasted the whole day. The planted tree types included ornamental and agroforestry species, intended for compounds and farms. This exercise came to fulfill Green Cameroon’s earlier intentions of extending the project beyond the immediate beneficiary communities of Bonakand, Ewonda and Woteke of the Buea community for whom the project was originally designed. It is Green Cameroon’s intention to make trees available to most communities of the Mount Cameroon Forest Region so that the collective planting activities will have the effect of reducing the rate of forest cover loss in this region. Green Cameroon is therefore using this opportunity to call on all other communities and institutions in these areas who are interested in the tree planting initiative to indicate interest and its team will be there to provide the trees and assist in the planting exercise. It should also be noted that the trees are given out at no cost and Green Cameroon demands nothing in return for the services but the sole commitment of which ever community or institution is asking for the trees, to ensure that the trees are well taken care of and grown up to serve the purpose for which they are planted. Join Green Cameroon to spread the word and contribute in your own way towards the conservation of nature in the Mount Cameroon Forest Region. 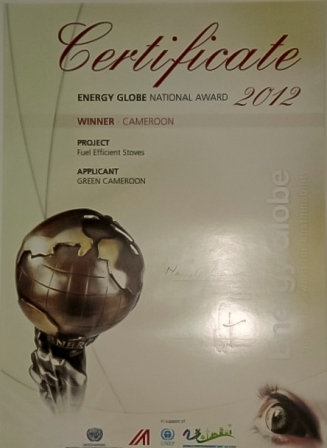 Join Green Cameroon and Be Part of The Change You Need!! !